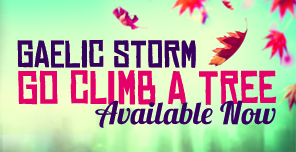 NEW ALBUM 'GO CLIMB A TREE' AVAILABLE NOW! We’re excited to introduce our latest album, Go Climb a Tree. With all the craziness and division in the world, we wanted to make an album about “contemplative escapism.” Go Climb a Tree certainly isn’t about dropping out of the conversation, it’s just about taking a short hiatus to recharge the batteries before you take on the world again. Sometimes you just need to take a break, get away, and go climb a tree.